The Afro-Portuguese restaurant chain Nando’s plans to expand in the UAE next year. The fast-food chain, which opened its first restaurant in the Emirates a decade ago, currently has 11 outlets in the country and aims to eventually double the number. It will open restaurants in Abu Dhabi city for the first time next year. “Ten years is a long time and we have strived hard to make this possible,” said Suhail Gidwani, the chief executive of Nando’s, UAE. Nando’s has several restaurants in Dubai, including in The Greens and The Dubai Mall, as well as outlets in Sharjah and Al Ain. It is understood that the chain will open two restaurants in the capital next year. The brand has not revealed where the restaurants will be, but said they will be in “prominent locations”. “Dubai is a fantastic place and it has been a joy for us to have woven ourselves into UAE’s family friendly restaurant scene. 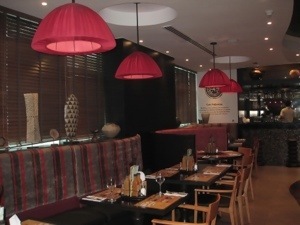 We are committed to capitalise the Afro-Portuguese authentic flavours to various locations in the UAE. With our presence in 11 outlets, the power of Nando’s is surpassing anything we ever expected,” said Mr Gidwani. “Our current focus is Abu Dhabi and looking ahead, we endeavour to double the number of restaurants we have today,” he added. Nando’s draws inspiration from ancient civilisation where people used fire to cook and is famous for its peri-peri chicken. The chain, which operates in 30 countries and has more than 1,000 restaurants, was founded in 1987 in a mining town in Johannesburg but its origins lie in Mozambiquan-Portuguese cuisine. Portuguese settlers in Mozambique were introduced to African bird’s eye chili, also known as peri-peri, which was used in local recipes. When Mozambicans of Portuguese origins moved to Johannesburg in search of jobs in the gold mining industry, they brought peri peri recipes with them. According to Euromonitor, the UAE restaurants sector was worth about US$1.15 billion (Dh4.22bn) last year, and is expected to increase to $1.21bn this year and continue to rise next year to $1.42bn. Posted on December 27, 2012, in Other. Bookmark the permalink. Leave a comment.